There are a variety of other pests that can enter your home and be a nuisance and health threat to your family. Appearance: Reddish brown to black, about one-eighth to one-fourth inch; elongated and slender. Habits: Females bore into wood and create tunnels for laying eggs; infest both softwoods and hardwoods, but cause most damage in hardwoods. Diet: Usually new wood, less than ten years old. Reproduction: Eggs are laid inside tunnels; larvae complete their development usually in about one year, but have been known to take up to five. Other Information: Often found in oak, firewood, and furniture. Appearance: Adults are small, slender and flattened, reddish brown to black; from one-eighth inch to one-fourth inch; short antennae; larvae are usually less than one-fourth inch long, cream colored and slightly C-shaped. Habits: Attack the sapwood of hardwoods, especially oak, hickory and ash; create small, round holes which appear in hardwood floors, furniture, molding and fixtures. Diet: Starch, sugar and protein in the sapwood of hardwoods; prefer moisture content of between 10 and 20 percent. Reproduction: Life cycle averages one year, with the majority of time spent in the destructive larval stage; females lay an average of 20 to 50 eggs. 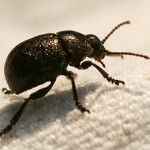 Other Information: Most common and widespread of the wood-boring beetles in the U.S.; pinhole openings in wood are a sign of infestation. Appearance: Adults are black to brownish-black, about five-eighths to one inch long; slightly flattened; wing covers are usually completely black, but may have distinct white markings. Habits: Larval stage feeds on seasoned timber for two to ten years before becoming an adult beetle; adult emerges from infested wood, leaving one-fourth inch oval exit hole, and mates, living only 10 to 15 days. Diet: Larval stage feeds on wood with moisture content of between 10 and 20 percent; prefers softwoods. Reproduction: Life cycle averages three to five years, but can take as long as 12 years, depending on environmental and nutritional conditions, with the majority of time spent in the destructive larval stage. Other Information: Contrary to its name, it occurs mostly in houses less than 10 years old. Appearance: Dark brown to blackish-brown, about one-eighth to one-fourth inch; range in shape from slender and elongated to oval. Habits: Larvae live in and create tunnels in hardwoods and softwoods, usually more than ten years old; create small, round holes of one-sixteenth to one-eighth inch diameter, which appear especially in structural timbers. Diet: Larvae feed on both hardwoods and softwoods. Reproduction: Life cycle averages two to three years, with the majority of time spent in the destructive larval stage; females lay about 50 eggs. Other Information: The potential for damage is greatest in the early period of infestation, when the number of exit holes in the wood is low. Appearance: Small, rounded, gray to blackish, with a varied pattern of whitish and orange scales on the back; shape resembles the lady bug; about one-fifth inch long. Habits: Adults often inhabit flowerbeds; can enter the home when cut flowers are brought in; outside, feeds on pollen and nectar. Diet: In homes, larvae will eat carpet and woolen fabric and other animal products. Reproduction: Female lays 30 to 100 eggs, which hatch in 10 to 18 days; larval stage lasts 60 to 325 days; adults live 20 to 60 days. Other Information: All damage is done by the larvae; contact with carpet beetles can cause dermatitis in humans.